The MRC/BHF Heart Protection Study was a landmark randomised trial completed in the 1990s that showed the benefits of lowering-cholesterol in over 20,000 individuals at high-risk of vascular disease. 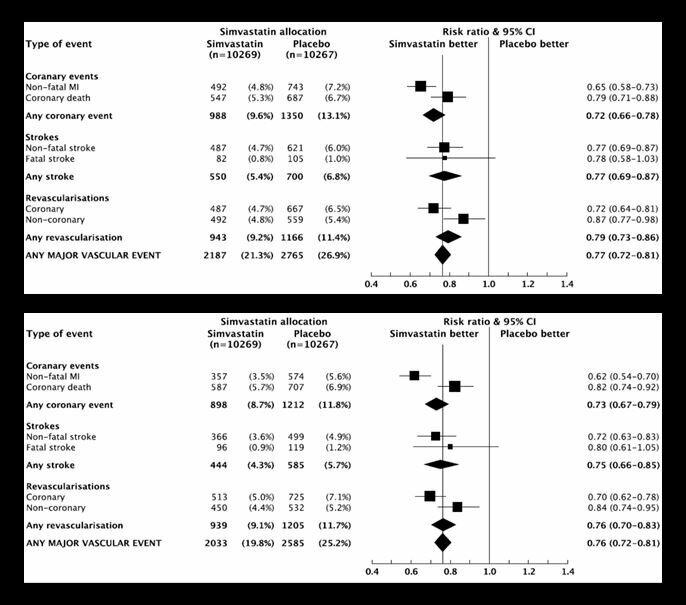 The results above show the benefit of cholesterol-lowering with simvastatin for a wide-range of vascular outcomes. The first plot shows the data as reported on the case report forms without any further checks and the second plot is for the data that was verified against primary medical notes. This is the un-adjudicated and adjudicated results of the trial. What the plots show is that for the various vascular outcomes the results are remarkably similar with no material difference in the results. This really matters because of the effort that was expended in verifying the various outcomes in the second plot (note the smaller number of events for each outcome due to events that could not be verified). The need for adjudication in the trial was required by regulatory authorities. This need for SDV, Source Data Verification required great additional effort during the trial with medical monitors contacting local physicians to identify a primary medical record where the various outcomes were recorded. These efforts added, perhaps, one-quarter to one-third to the overall budget for the trial. This is an example of where ICH-GCP focuses on things that don’t really matter, in this case the need for data verification, adding great additional effort, complexity and cost without any clear rationale for why it is needed in the first place. Instead, it would have been better to focus efforts entirely on those few things that really do matter, in the case of HPS this was ensuring proper randomisation for the range of vascular outcomes being studied. In general, where ICH-GCP requires data verification effort and time could be saved by instead focusing on proper randomised comparisons. Returning to first principles, what really matters when doing a randomised trial is, firstly, the reliability of the result and, secondly, the safety and wellbeing of the study participants. This example clearly shows that all of the efforts to verify outcomes had no effect on the reliability of the overall result, but neither did if impact participant safety as all of the verification was carried out after all of the participants had completed the trial. This is what we mean by ICH-GCP focusing on things that don’t really matter.